To celebrate finishing my PhD, I threw a defense party at our local bar (co-hosted by my friend and fellow recent defendee Angela Fink) and brought a bunch of pies. I wanted to try something new and was inspired by a show I love, Pushing Daisies, where one of the main characters is a pie-maker. Several interesting pie flavours were introduced on the show, including pear with Gruyere crust. Pie and cheese? Two of my favourite things! For the crust, whisk together flour, salt, sugar and Gruyère. Using a food processor (or pastry blender), mix flour mixture with butter until it resembles coarse meal. Add water, one tablespoon at a time, mixing the water with a fork before adding the next spoonful. Once the dough begins to clump together, squeeze the flour mixture together and form into two discs (one bigger than the other). Wrap in plastic wrap and chill overnight . 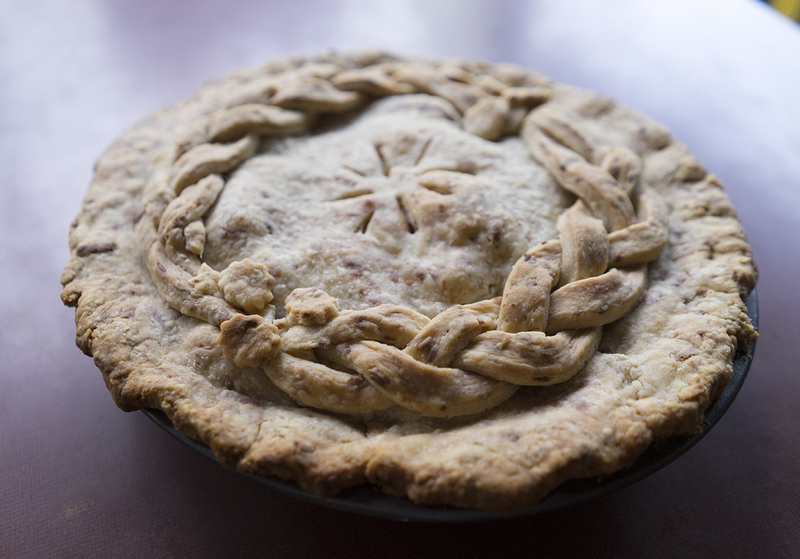 When ready to prepare the pie, roll out the larger of the discs on a lightly floured surface and place in 9″ pie pan. For the filling, toss pears with lemon juice to prevent browning. Mix in the first six ingredients, then stir in vanilla. Pour into prepared pie plate. Roll out other dough disc and plate on top, crimping edges decoratively. Bake at 425 F for 15 minutes before lowering the temperature to 350 F. Bake for 40-50 minutes or until crust is golden brown. Let cool slightly before serving. I’d never made a pear pie, but it was quite similar in flavour to apple. I used smoked Gruyere to ensure that the cheese flavour would be strong enough. It was definitely a delicious combination–sweet and a little bit savoury. The crust turned out particularly well. The pie was quickly gobbled up by guests, so I’ll have to make it again to get a bigger taste!